我使用了這個軟體,應用在我的SE Mini Pro 上後,對方跟我表示經常聽到他們自己說話的迴音. 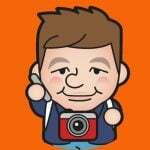 我拿了別人的手機打給我自己,請別人再拿著我的手機到別的地方對話,真的能聽到自己說話的迴音. 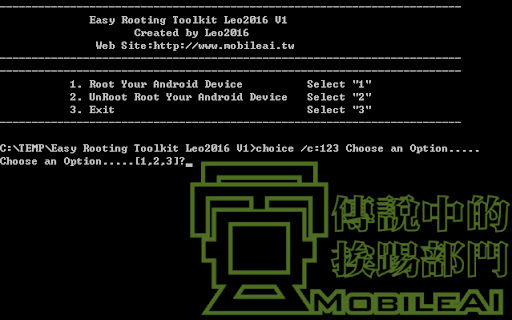 V2>choice /c:123 Choose an Option…..
然後… 用Easy Rooting Tool kit Leo2016V1復原原廠??還是說兩者都可以復原原廠? 所以 4.0.3 不適用 這款ㄉ ROOT 權限ㄇ??? Please advise what we need to do after root Nexus one. Should I need to install CM7 or other Rom? Besides, I installed many apps in Nexus one. Will they all removed after rooting. 請問是否仍可用這個方法來 root 4.03 版? 謝謝! G:\Easy Rooting Toolkit Leo2016 V2>choice /c:123 Choose an Option…..
如果sony ericson play 手機開機後 出現Sony Ericson 之後就進入黑屏 但手機是亮著 這要怎麼處理呢? Work like a charm! Million thanks! 請問LEO大大，此ROOT工具適用於Samsung Galaxy S2 Android 4.0.3版本嗎?? 你好, 請問 Samsung Note LTE 能用嗎? xda 均可提供由 root 至 unroot 的軟體, 我也看見其他使用者把 root i717 的方法, 成功套用到 lte 當中. 但 unroot 的話, 只能還原至 i717 的模樣, 這個狀態是不能在香港保修的. ice /c:123 Choose an Option…..
請問Samsung Galaxy Mini GT-S5570是否可以ROOT 且我下載來的檔案怎壓所解? RAR檔案要怎壓縮?